Making your own holiday decorations, like sparkle balls is a lot of fun and will be really easy to do. 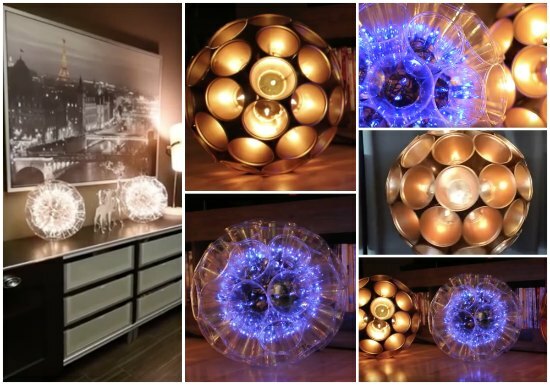 You might already know how to make DIY sparkle balls, but how about metallic sparkle balls? This decoration will be perfect to put on display when the holidays arrive. Set at least 50 plastic cups outside on a flat surface and spray them with the metallic paint. You can set the cups open side up or open side down. Allow the paint to dry for about 30 minutes. Attach the drill bit onto the power drill and drill a hole into the bottom of each plastic cup. Staple two cups together with the stapler. Attach more cups until you have a complete circle. A circle is 12 cups. Lay nine cups on top of the circle of cups you just created. You can use the clothes pins to secure a few of the cups when stapling them together. Attach three more cups to the top to create a half circle of plastic cups. Repeat steps 3 through 5 to create another half circle of plastic cups. Insert the string of lights into each half circle of plastic cups. Make sure the power cord can reach an outlet and then secure the two halves to complete your sparkle ball.